Guernsey No. 39 (1962 - 1968). 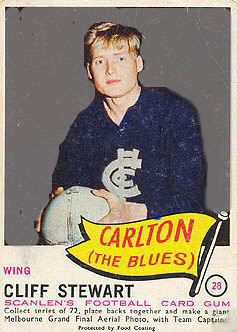 A blonde-haired, lightly-framed wingman recruited from Gippsland club Thorpdale, Howard Clifford Stewart played seven seasons of senior football with Carlton during the mid-sixties. Although he was nimble and had good foot skills, Cliff came in for plenty of punishment in the hurley-burley of sixties football. In particular, Des Tuddenham of Collingwood seemed to make a point of seeking out Cliff when the old foes met, but what endeared Stewart to Carlton fans was that no matter how many times he was bowled over, he always bounced straight back up. Wearing guernsey number 39, 20 year-old Stewart made his debut as 20th man against Fitzroy in round 10, 1962, in a cracker of a match at the Brunswick St. Oval. Carlton charged home from 12 points down at three-quarter time to win by a point that afternoon, but it was a rare bright moment in a gloomy era of little success for the Blues. It took another two seasons for Cliff to establish himself as a regular senior player, and in 1964 he didn’t miss a game. Under new captain-coach Ron Barassi in 1965 he played all but two games, although the emergence of two of Carlton’s great wingers in Garry Crane and Bryan Quirk made Stewart’s regular place in the team less secure. Still, he carried on playing good football, and in 1967 was selected in a Victorian B team for a match against Tasmania. The Blues made the finals at last that same year, and Cliff experienced the thrill of finals football, as well as the bitter taste of defeat in successive losses to Richmond and Geelong. The trend toward taller, physically-stronger wingers, and a bout of glandular fever combined to restrict Cliff to only nine senior games in 1968. In what turned out to be his last appearance, he was as keen and courageous as ever when Carlton thumped Collingwood by 37 points at Victoria Park in round 18. But after that he was overlooked for a place in Carlton’s historic finals campaign, and amidst the wild celebrations of Carlton’s first flag for 21 years, Cliff realised that the time had come to move on. The main beneficiary of that decision was Diamond Valley Football League heavyweights, Eltham. Stewart joined the Panthers in 1969, and, playing dominant football as a free-ranging centreman, helped drive them to consecutive Premiership victories over Diamond Creek in 1969 and ’70. He was also a popular winner of Eltham’s Best and Fairest award in 1970-71. Contributors to this page: Jarusa , molsey , pblue , Bombasheldon , PatsFitztrick , p(12)terg , kkk and admin . Page last modified on Tuesday 23 of May, 2017 23:18:59 AEST by Jarusa. 1983 Rd 12 - Ditchburn, Sheldon & Hunter fight for the ball.